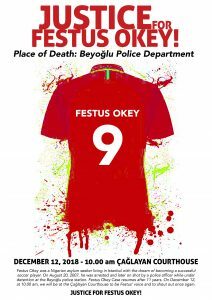 The case on the murder of Nigerian Festus Okey in Beyoglu Police Station of Istanbul is reopening after 11 years. The groups of activists and human rights organizations declare that they will keep following the case and asking for justice. Festus Okey was a Nigerian asylum seeker living in Istanbul with the dream of becoming a successful soccer player. 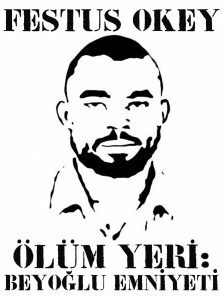 On August 20, 2007, he was arrested and later on shot by a police officer while under detention at the Beyoğlu police station. Seriously injured, he died in the hospital, where the shirt he wore on that day – a crucial piece of evidence to prove the shooting distance – went lost. A prosecution was brought against the police officer who shot Okey, however, the case turned into a judicial quagmire that lasted for many years. In 2011, the court sentenced the defendant police officer to 4 years and 2 months of imprisonment due to involuntary manslaughter but he never went to prison. A member of the court claimed he should have been tried for murder and sentenced to 20 years of imprisonment. The decision was appealed. During this process, the court postponed the hearings for countless times, as its priority was the verification of Festus’ identity and not the concealment of the evidences. Activists and organizations for the defense of human rights such as the Migrant Solidarity Network (GDA, Göçmen Dayanışma Ağı) have followed the case for years. Some even requested involvement in the trial but the request was dismissed and followed by criminal complaints against them for “insult” and “attempt to influence a fair trial”. After years of effort, Festus Okey’s lawyers managed to reach his elder brother, Tochukwu Gameliah Ogu, who lives in Nigeria. Ogu’s request to join the criminal proceedings was rejected since the court did not consider the DNA report as a relevant document to prove family relationship. Few weeks ago, the upper court dismissed the refusal of the involvement request by Festus Okey’s elder brother and ruled that the decision can be reconsidered after his identity verification through a DNA test. Following the conclusion, İstanbul 21st High Criminal Court set the next date of trial as 12th of December 2018.